Whisk sugar substitute, brown sugar, peanut butter, milk, and margarine in large saucepan. Bring to a boil over medium-high heat; boil 1 minute. Remove from heat. Stir in vanilla and oats; let stand 1 minute. Stir in rice cereal. Drop mixture by tablespoons onto baking sheet lined with parchment paper. Refrigerate 20 minutes or until firm. 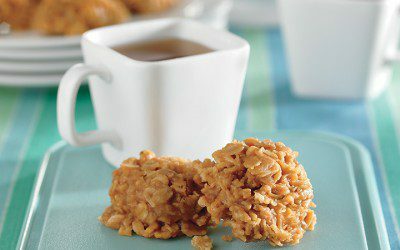 *This recipe was tested using sucralose-based sugar substitute.